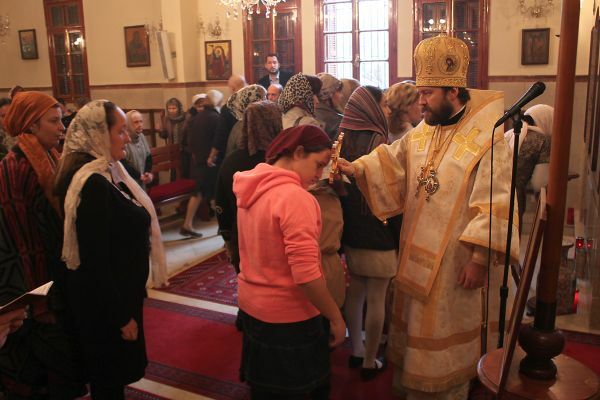 On 9 December 2012, Metropolitan Hilarion of Volokolamsk, Chairman of the Moscow Patriarchate’s Department for External Church Relations, celebrated the Divine Liturgy at the Church of St. John the Baptist in Mar Elias district, Beirut, where the Russian-speaking Orthodox Christians residing in Lebanon receive spiritual care. Prayers for the rest of the deceased Primate of the Orthodox Church of Antioch were offered during the Liturgy. Concelebrating with Metropolitan Hilarion were ordained members of the Russian Orthodox Church delegation who arrived in Beirut to take part in funeral ceremonies and archpriest Anatoly Yegorov, rector of the Russian parish in Beirut. Ambassador of Russia to Lebanon, Alexander Zasypkin, and many worshippers attended the service.